A Buick GNX is coming, but it's not coming from Buick. Performance company SLP plans to build their own GNX, pictured above, with output above 300 horsepower and a more aggressive look. Unless they make one key improvement I don't think this is the GNX Buick should build. SLP has acquired the rights to the "GNX" name reports InsideLine, with the intention of building 500 new copies of the once fabled car. Unfortunately, there's no word yet on them changing the FWD nature of the vehicle. Buick will likely never build a Zeta-based Regal GNX, which is the only way to pay true homage to the original rear-wheel-drive turbo V6 death metal rocket. But they could easily build a hi-po AWD version of the Regal, which they already do in Europe. It's called the Insignia OPC and it looks mean, gets 325 horsepower and has a torque-vectoring Haldex AWD system. And that's the one they should and easily could build. 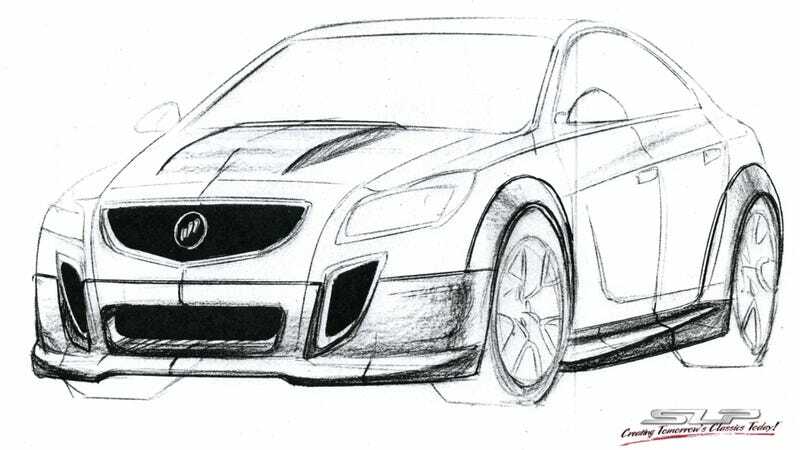 The SLP GNX will likely be a fine car, but more power isn't what's missing from the Regal GS or Regal Turbo.